Today wasn't a day spent on the beach because of the weather, but it was still great because we're in Florida. The sky was the cloudiest it's been since we got here, but I lay out on the beach for about half an hour as soon as I saw the sun come out for more than 5 minutes. As long as it’s not raining, I want to be on the beach. Eventually I gave in to the clouds and went inside to do some homework and start on my 10-page building code analysis. Fun, right? By the time Amy and Dad woke up and got dressed, we decided today would be a good day for a movie, so we saw This Means War. Reese Witherspoon never ceases to amaze me. She and Chelsea Handler were hilarious. There were some really funny parts where I literally couldn't stop myself from laughing. It's a romantic comedy, but the fact that the two guys Reese (I forget her character’s name) is dating are secret agents provides a lot of action sequences. After the movie, we went to Target to pick up a few things. I bought an SD card reader because apparently I lost mine. I managed to drop it from three stories up, though, while trying to take a picture of the sunset from the balcony. It broke open, but I snapped it back together, so I guess we’ll wait and see if it still works. We ate dinner at Galaxy Pizza in the mall next to the movie theater, and it's the best pizza we've had since being here. I think that's the third pizza place we've eaten at in a week. Ha ha. We did a little window-shopping, then drove back to the hotel. I went for a walk along the beach by myself. I saw another Portuguese Man-of-War. It must have just washed up before I took its picture because it was the most intact Man-of-War I’ve seen in all our trips to Florida. The rest of them have just looked like deflating purple balloons. This one actually had a tentacle left, too. They're usually just the "balloon" part. Later, Amy and I walked down to the shops by the pier. 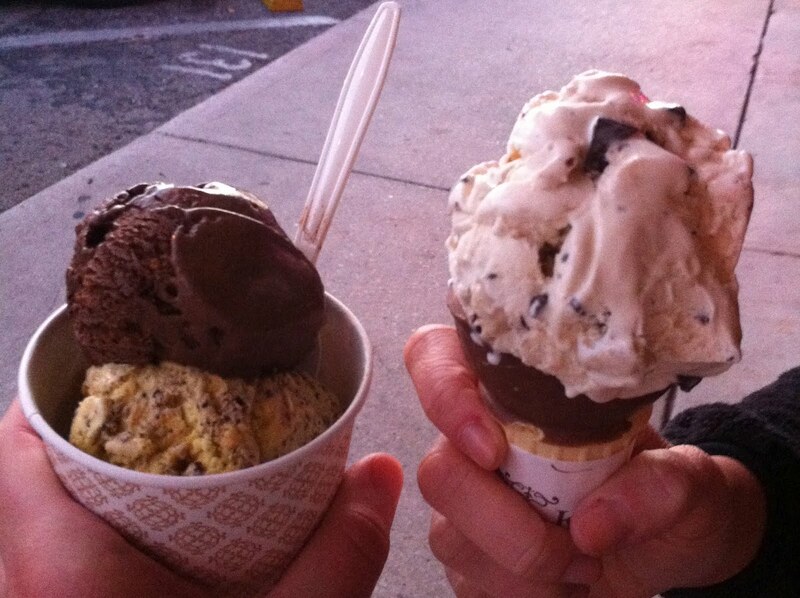 First, we had some ice cream from a place called Kilwin’s. It was so rich that I couldn’t eat it all. That’s the first time that’s ever happened. Ha ha. It was a scoop of cake batter flavored ice cream with actual cake in it and a scoop of chocolate peanut butter ice cream. All full of ice cream, Amy and I did some souvenir shopping. Every year we’ve been here I’ve bought a t-shirt, shot glass, and sea turtle of some sort. I don’t know why, but I’ve always collected turtles from every trip we’ve been on -- not just including Florida. While we were at the shops, Amy absolutely had to go back to Doggies and Diamonds. They had a Golden Retriever puppy and Amy got in a little room to play with her. She was so cute and made me miss our dogs at home. The sky started to flash with lightning, so we headed back to the hotel around 9 o’clock. I took another bath in the ever-so-amazing whirlpool tub, and now it’s time for some sleep. 1 more day! Let’s hope it’s a great one!